Netgear CM600 Vs CM500 - Which is better? If you have spent some time browsing through the Internet looking for a reliable modem, then you may have come across Netgear products. The company has manufactured a number of high-quality routers and modems, and a lot of users actually love their models. 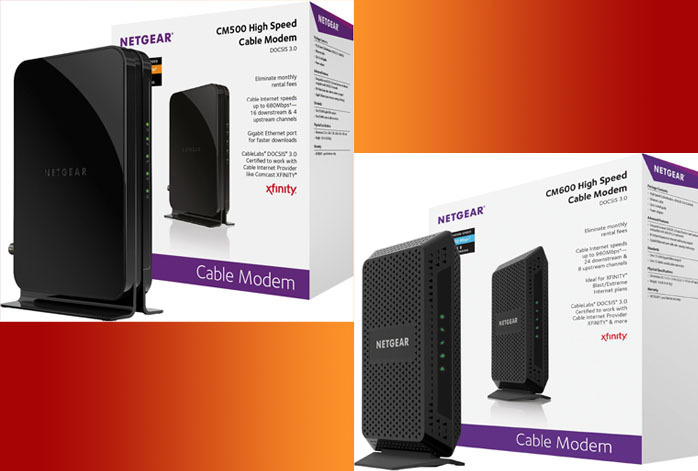 Netgear CM500 and Netgear CM600 are their modem models that offer excellent performance. Of course, Netgear CM600 is a little bit more expensive than Netgear CM500. What are the differences between the two? Which is the one that is best for you? Netgear CM500 and Netgear CM600 also come with many identical features. They both have been designed to satisfy DOCSIS 3.0 specifications, yet also backward compatible with DOCSIS 2.0 networks. They are also certified for XFINITY Internet plans, and they support IPv6. They boast a superbly easy and practical installation process, as they don’t use any CD to be installed.They each comes with 8MB NOR flash and 128MB RAM. They do support Advanced Quality of Service, which means, they can give you various network control and management features, including access restrictions and bandwidth prioritization. Don’t forget that you may need a router to build a network with your modem. The primary differences between Netgear CM500 and Netgear CM600 are the available channels and bandwidth. Netgear CM500 comes with 16×4 channel bonding that can provide a maximum download speed of 680 Mbps. On the other hand, Netgear CM600 boasts 24×8 channel bonding that enables a maximum download speed of 960 Mbps. For sure, Netgear CM600 can give better download and upload rates than Netgear CM500. However, does the difference very significant? In real-life usage, the increase is somewhat marginal, as the performance of CM500 is decent and satisfying already. For personal usage or a small group of people, CM500 can do well. Yet, CM600 indeed can be a huge help if you have to serve numerous devices in your network. The only actual differences between Netgear CM500 and Netgear CM600 are the available channels, and, as the effect, maximum bandwidth. Unless you have a lot of devices in your network, CM500 holds the fullest value for the money. Otherwise, CM600 is the way to go.